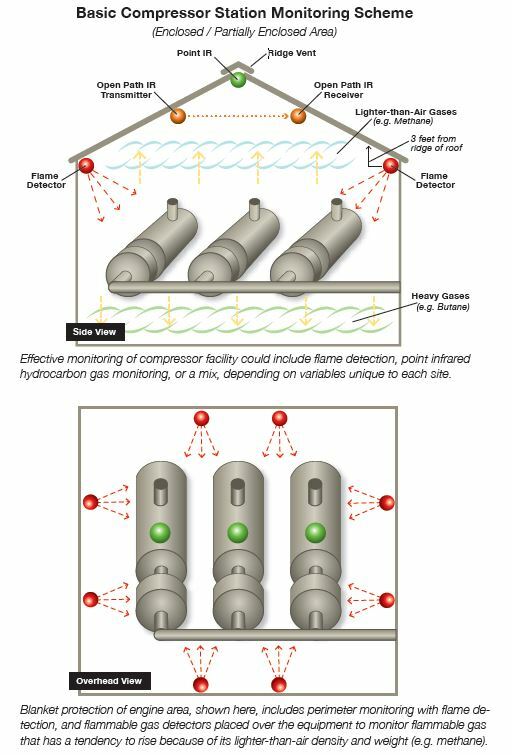 One of the most important components of the natural gas transportation system is the compression station. These stations are the workhorses of the gas pipeline; they perform essential tasks such as cooling, compressing, and purifying the natural gas stream at regular intervals. It is this compression and cooling that allows the gas to continue flowing through the pipeline and to its final destination for distribution to refineries and other end users. Compressor stations can generate up to 10,000 pounds per square inch (psi) pressure. The enormous pressure created along the process posts a high risk of fugitive gas escape, and for this reason, gas monitoring along the entire system route is essential. Installing gas and flame detectors in and around turbines should be done to enhance safety as well as productivity and efficiency. One benefit from gas detection, for example, is that it can prevent engine runaway. Another use for gas detection is to prevent build-up of an explosive mixture in the area which surrounds the gas turbine, especially if that area is enclosed (e.g. acoustic chamber). We highly recommend using a combination of different detectors such as: open path flammable gas detector, point infrared flammable gas detector and flame detector, along with a controller. The items listed below are some of the recommend products to use in compression stations.